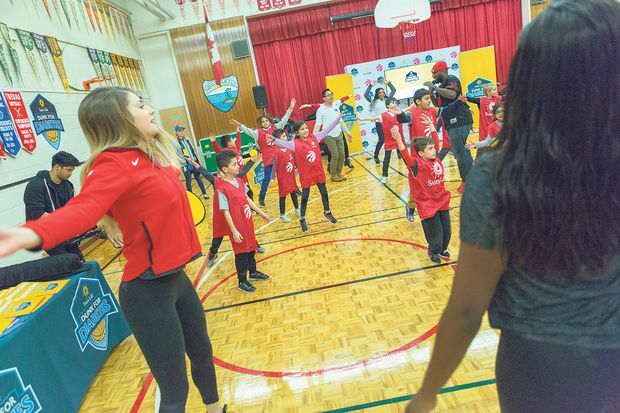 Sun Life’s Dunk for Diabetes program encourages healthy habits including basketball-inspired fitness challenges. A basketball-inspired program to support physical activity and healthy eating among children – a partnership with health-care experts to help prevent type 2 diabetes in women after childbirth: These are just two of the partnerships created by Sun Life Financial in its commitment to fight the growing diabetes epidemic. Since 2012, Sun Life has made prevention of diabetes and its complications an important cornerstone of its donations and sponsorships around the world. The company has committed $22-million globally in diabetes awareness, prevention, care and research, as part of its commitment to building stronger, healthier communities. In Canada, Sun Life is collaborating with various partners at both the national and regional levels, to help combat diabetes and prediabetes, which currently affect one in three Canadians. These partnerships are part of Sun Life’s Team Up Against Diabetes platform, and they include programming focused on young people. Once seen only in adults, type 2 diabetes is now on the rise in children in Canada, with obesity becoming the biggest contributor to this trend. Recognizing that a healthy diet and an active lifestyle can help prevent diabetes in young people, Sun Life has teamed up with the Toronto Raptors, NBA Canada and Boys & Girls Clubs of Canada to bring Sun Life Dunk for Diabetes to life. Another example of Sun Life’s support to prevent the disease is a program to help prevent type 2 diabetes in women following childbirth. Some women develop gestational diabetes during pregnancy. This form of diabetes can be managed and often goes away after birth. However, women who have had gestational diabetes are at an increased risk of developing type 2 diabetes later in life. To support interventions that can minimize this risk, Sun Life recently launched the Sun Life Financial Program to Prevent Diabetes in Women in conjunction with Sinai Health System in the Greater Toronto Area. The Sun Life Financial Program to Prevent Diabetes in Women will aim to transform treatment for women by developing a risk calculator and risk assessment tools that will screen, monitor for and prevent the onset of type 2 diabetes post-pregnancy for a pilot group of women affected by gestational diabetes. Through these and many other partnerships and programs, Sun Life is fulfilling its commitment to slowing the advance of diabetes and its related complications, and building healthier communities across Canada.